If you have teeth that are crooked or misaligned, it’s affecting your life in many ways. You may feel embarrassed about the appearance of your smile, which definitely takes a toll on your confidence. Did you know that crooked teeth can also affect your oral health? When your bite is misaligned, it often contributes to a painful jaw joint disorder known as TMJ. Crooked teeth are also much harder to keep clean, which puts you at a higher risk for other conditions such as tooth decay or periodontal disease. Have you ever considered straightening your teeth? Learn more about Invisalign from your cosmetic dentist in Creve Coeur. Instead of utilizing traditional metal braces, Invisalign uses clear plastic aligners to apply gentle pressure and gradually straighten your teeth over time. Your aligners should be worn for 20-22 hours per day and changed every two weeks. Most Invisalign cases take 12-18 months to complete and the result is a beautifully aligned smile that you’ll be proud to share. There are many benefits that Invisalign has to offer, but probably the biggest is that because your aligners are clear and snug fitting, Invisalign is virtually unnoticeable. You’ll be able to talk, smile and interact with people normally and they’ll never know you’re straightening your teeth. Your aligners are also removable, which means that you can take them out for eating, brushing and even the occasional big event or meeting. You’ll be able to enjoy all the foods you’re used to because there are no diet restrictions with Invisalign. Your oral hygiene shouldn’t suffer during Invisalign treatment since you’re able to brush and floss as you normally would. If you’ve considered straightening your teeth but have been put off by the thought of wearing bulky metal braces, contact your dental provider to learn more about Invisalign. Your dentist can tell you if you’re a candidate for Invisalign by performing a thorough exam and taking some photos and x-rays. If Invisalign isn’t in your future, there may be other options for straightening your smile that your dentist can discuss with you. At Feigenbaum Dental, our doctors are proud Invisalign providers and they can help guide you through the process of aligning your smile. As your premiere cosmetic dentists in 63141, Drs. 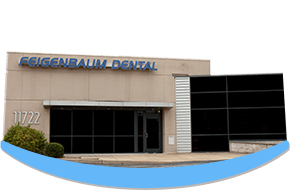 Feigenbaum offer personalized dental care and individual attention to every patient. They have many years of experience in helping patients achieve smiles they’ve always dreamed of, and the dental skills to meet your needs. Don’t let crooked teeth hold you back any longer, contact our office today to learn more about Invisalign.